The Senran Kagura franchise may not have modest origins, nevertheless the franchise has become a formidable series in Japan, spawning an anime series with multiple OVAs (“original video animation”) special episodes; the series has since parted with its 3DS-exclusivity, with a handful of titles on the PS4 and PS Vita, along with a Japan-exclusive free-to-play mobile card game. Senran Kagura‘s popularity helped Producer Kenichiro Takaki spawn the women-transform-into-weapons Valkyrie Drive franchise, and spark the all-male spiritual successor Uppers. 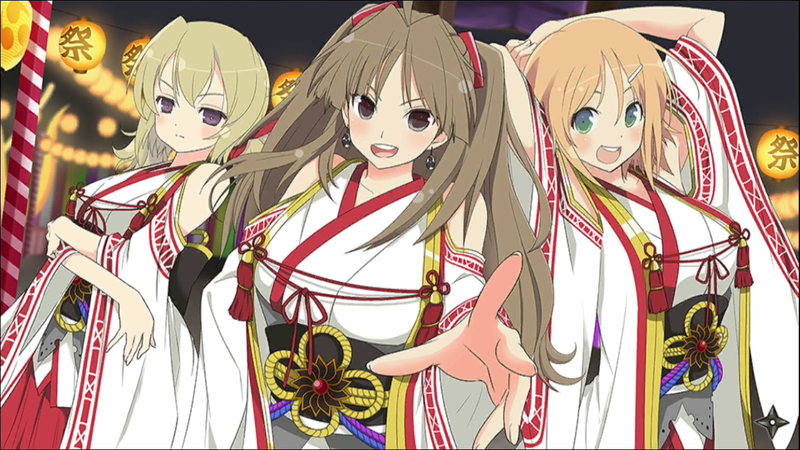 Orchestrated by Asuka’s grandmother Sayuri and her shrine maidens- the Mikaruga Sisters, the island is home to the Kagura Millennium Festival, an 8-day celebration to mark the passing of fallen souls, and to grant a young shinobi the title of Kagura, the highest ranking form of ninja within the Senran Kagura universe. Under the supervision of Ryoki and Sayuri, a former Kagura herself, the students and factions are granted a series of Festival Platforms to defend from each other; the team with the most platforms on the final day of the Kagura Millennium Festival will begin their path to becoming Kagura-level shinobi. As the festival progresses, the young shinobi discover that the Kagura Millennium Festival not only tests their physical prowess, but their mental and emotional stamina, as several students encounter the fallen souls of loved ones, and must decide between staying behind on the island, or parting ways with their loved ones for a second time. Previous core installments of the Senran Kagura titles- despite their generous fanservice- have a fair amount of depth, with pacing that never leaves the player feeling stranded between story elements- Estival Versus is an unfortunate exception. Much like the DOA Extreme [Beach Volleyball] games, the hot springs chapter of Asura’s Wrath, or the Summer vacation episode of any anime series, Senran Kagura: Estival Versus is the overtly obvious “Beach Episode” of the Senran Kagura franchise. Over the course of 57 missions across 9 chapters (“Eve Festival” followed by 8 “Days”), 34 missions directly progress the story forward through vague hints or a few lines of dialogue relating to the Kagura Millennium Festival. Though some missions deviate from the main plot to develop the internal conflicts of some characters after they encounter the souls of their loved ones, the remaining 23 missions are devoted to beach hijinks, with prime examples relating to Yomi’s and Yozakura’s cooking, and the “Surprise Shinobi Slippery Splash-n-Spray Sports” missions of Day 2. 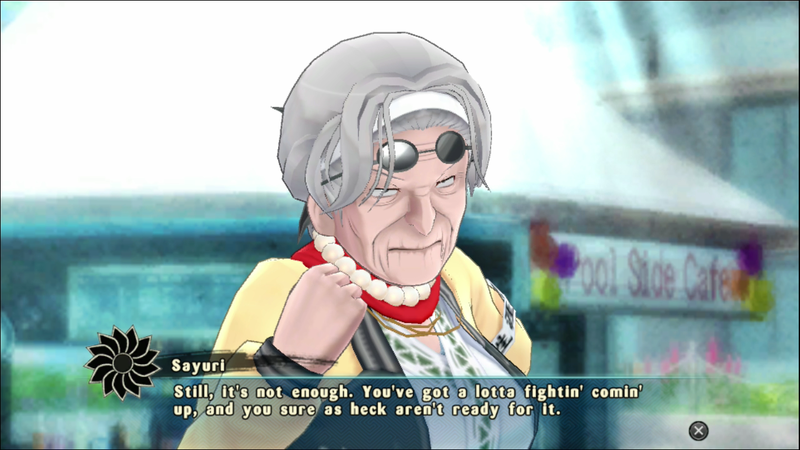 A handful of instances involve Sayuri mentioning the coming of an apocalyptic Yoma, the demons fought in Senran Kagura Burst and Senran Kagura 2: Deep Crimson, however this is quickly lampshaded by the questionable antics of the characters. Story has never been the strongest element of the Senran Kagura franchise, but those who’ve invested into the previous games may find the plot in Estival Versus to be weakest of the core series. 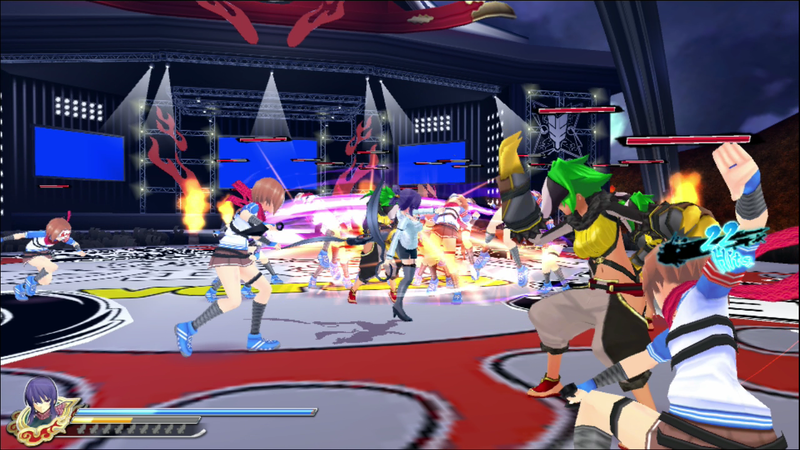 The story may have taken the back seat in Estival Versus, however the gameplay continues to evolve and expand on its frantic roots. Simplified, Senran Kagura is a traditional hack-n-slash where the player must fight their way through waves of enemies until the mission is complete. The franchise tweaks the genre to the extreme, allowing players to perform combo moves that may result in launching enemies into the air; once the player-character has reached a specific Level, she can unleash a chained “Aerial Rave” for maximum damage. Unlike the 3DS installments, players cannot perform an infinite air combo chain in Estival Versus. Apart from health, each character has an additional Ninja Arts meter and a Ninja Art Scroll stock; the meter fills with every successful attack, with a full gauge resulting in a new Ninja Arts Scroll. Once the player has a Ninja Arts Scroll, the character can transform into her Shinobi mode, resulting in higher defense and offense, and the ability to use Ninja Arts Scrolls to unleash special Ninja Arts attacks. Depending on each character’s Level, she can use 1-5 Scrolls to strike with a normal, Special, or Ultimate Ninja Arts attack, with each having different attack properties ranging between projectiles, special combos, beast summoning, and timed-invincibility. As with the lacking infinite air combos, players cannot perform Ninja Arts in the air- a feature last seen in the two 3DS games. During the course of battle, characters may lose parts of their outfit if they take too much damage; this also goes for boss characters, not only lose clothing from extensive damage, but may be stripped altogether if the fight is finished with a Ninja Arts attack. A first for the series, boss fight areas also feature Creative Finish stage hazards; if the final blow is dealt next to a signpost marked with an exclamation point, the boss character may find herself launched through a billboard, stuck in a tree, trapped in a cage or other humiliating situations. If the player is in a bind, he or she can have the character perform a Frantic Transformation; rather than opt for the safe Shinobi Transformation, the character will shed her clothes in exchange for superior attack power at the cost of defense; Frantic mode is an extreme risk/reward tactic, as the character is susceptible to dying in just a few hits. Some missions partner the player with an AI-controlled character; in these situations, the player can perform a Fusion Aerial Rave as long as both characters are close. 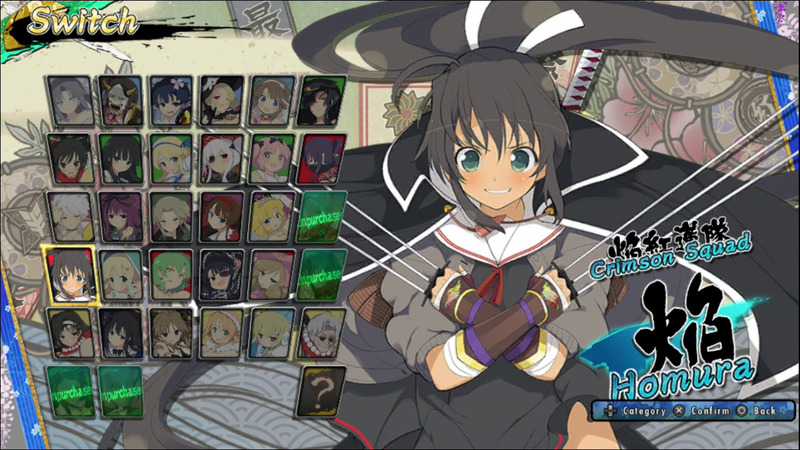 Over the course of the 57 missions, players will control 25 characters, each with her own unique set of skills and proerties. The complete roster includes 32 characters, though at the time of this review, four have not been made available on the North American PSN Store. Outside of the four factions and “Overseers of the Festival” (i.e. Sayuri, Ryoki and the Mikaruga Sisters), Daidoji, Rin and Jasmine are playable after completing specific segments of the story; Deep Crimson‘s Naraku and True Kagura, shopkeeper Ayame, and Dead or Alive/Ninja Gaiden‘s Ayane are listed, but not yet available to purchase as DLC. By completing the main Kagura Millenium Festival missions, players will unlock multiple items in the shop, including artwork, movies, special finishers, music, outfits and accessories for each character, of which can be customized and viewed in the Dressing Room. 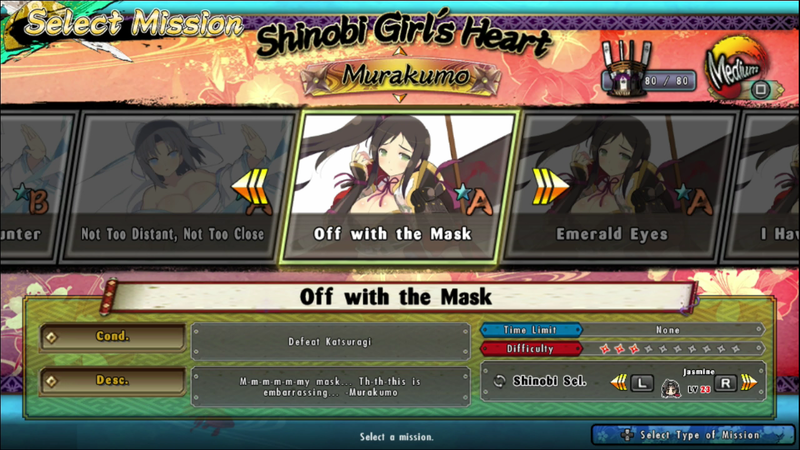 If the player fulfills certain requirements, being story progression or destroying a certain number of festival platforms hidden in select missions, additional Shinobi Girl’s Heart missions will be unlocked outside of the main story; Shinobi Girl’s Heart includes personalized stories for 27 characters across 135 missions. Two additional Special Missions are available, however these primarily serve as an advertisement for the Estival Versus OVA anime specials. Senran Kagura: Estival Versus may be set within a tropical island paradise, however the beach is just one of numerous locations for the young ninjas to do battle. Through the power of Sayuri’s magic, the action takes place on several varying locales, some of which are from the previous games. Larger 3D levels first started appearing in Shinovi Versus and Deep Crimson, however Estival Versus is the first title that actively encourages players to explore each environment, as the player must find and destroy 80 Festival Platforms during the Kagura Millennium Festival campaign. These branching, fleshed-out areas include the likes of the Training area from SK2 and Shinovi Versus, the sprawling network of the Hebijo Clandestine Girls’ Academy rooftops, a winter oasis, the streets of downtown, and even a self-referential Festival stage lined with Senran Kagura artwork and merchandise. Naturally, the overall visual presentation is beneath that of its PS4 counterpart; while character models and environments remain highly detailed and animated, the background elements during story conversations and some of the environmental textures are rather “muddy” with their low resolution. Despite the lower resolution of the PS Vita version, developer Tamsoft spent a considerable amount of time focusing on the little touches that players may not notice during their initial run through the game. 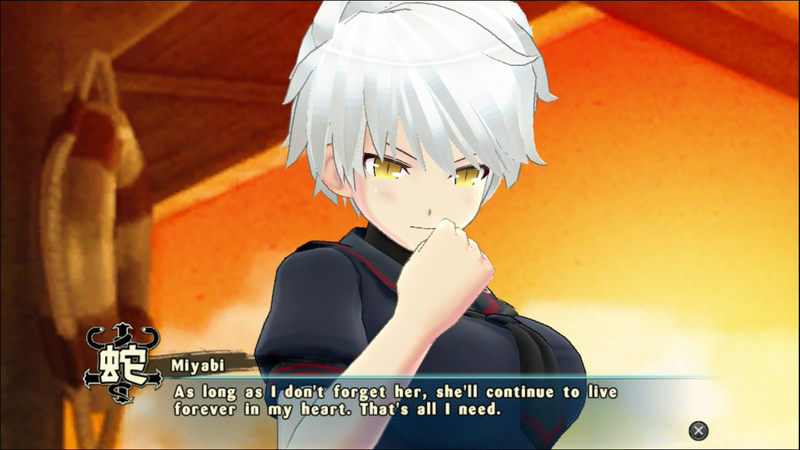 Depending on which character the player last used, the background animation of the main menu will change to reflect that faction; if the player selects Miyabi, then backs out to the main menu, the background will feature the girls of Hebijo Clandestine Girl’s Academy. Shopkeeper Ayame can also be seen in both her 2D and 3D renditions by selecting the Shop with either Start/X or Triangle. The diverse environments and battles are backed by a staggering 70-song soundtrack containing everything from orchestral arrangements to rock and J-Pop. Boasting a grand total of 194 missions and well over 200 items to unlock in the store, Senran Kagura: Estival Versus is one of the most robust titles across the franchise. With the bombastic combo and air-based nature of its gameplay, the title has much to offer for fans of the series, however Estival Versus is plagued by the overall loose presentation and pacing of the story, with a glaring plot-hole and story elements falling behind the fanservice. Senran Kagura: Estival Versus is a fantastic title for die-hard fans of the series, but newcomers may want to start on a previous title before heading to the beach with the ninja schoolgirls. Good to see games like this come out in the West. Too many things are getting censored these days.